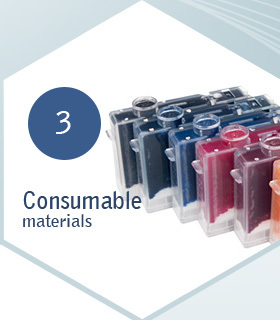 We offer consumable materials for most laser, ink and pin printer, copying and fax machines available on the market. We offer: toners, inks, printer ribbons, thermo-transfer rolls, photosensitive drums. Apart from genuine consumable materials, we also sell bargain materials of similar quality but at much lower prices. A selection of alterative materials allows to achieve savings on costs connected with creating documents. All consumable materials are covered by producers' warranties.